It might sound crazy to some, but like humans, horses need shoes too. To understand why a horse needs shoes I will answer two important questions. First, why does a horse wear shoes and second, how do you know when your horse needs shoes? The answer to question one may seem simple at first; horses wear shoes to protect their feet. Shoeing a horse is often considered the humane thing to do when caring for horses because it helps prevent injuries, and can keep the hoof from wear and tear that can cause significant pain for the horse. Be sure to watch your horse carefully for signs of discomfort from excessive chipping or bruising from rough terrain and over growing of the toes. Shoeing a horse can provide balance and stability so that the horse does not feel strain when walking and running. There are many reasons why you may need to shoe your horse. 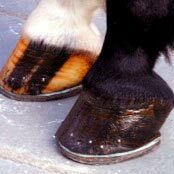 For example, a cracked and broken hoof, the clinches have risen, the shoe is overgrown by the foot, missing nails, or a shoe that needs to be reset. These are all cases where you need to shoe your horse for its own safety and health. Keep in mind that not every horse needs to be shoed. To truly determine whether your horse needs shoes or not, have a farrier, which is a specialist in equine hoof care to examine how strong your horses feet are, their integrity, and how much they may be worn from rough terrain. A horse with strong feet like most wild horses may not need shoes like a horse that is ridden on mostly soft ground. Shoeing a horse should be done case by case. Horses are like humans in that every one is individual and has different needs when it comes to caring for your feet. There will always be some exceptions as to why or why not your horse may need shoes. A good way to think about when your horse needs shoes is to look at your very own feet. If your feet are rough, sore, injured, sensitive, and not used to being barefoot, then you may require a shoe with cushion that offers plenty of stability. Horses are very similar in that their feet require the same amount of love and protection that we provide our own feet. Look at each of your horses individually, and understand the effect the terrains have on their feet and how frequently they are ridden. Even though your horse may or may not have the strongest feet, shoeing your horse will protect their feet and toes from damage and give them an easier ride. All in all, if you are unsure about shoeing your horse, consult with a farrier and discuss whether your horse needs shoes or not.